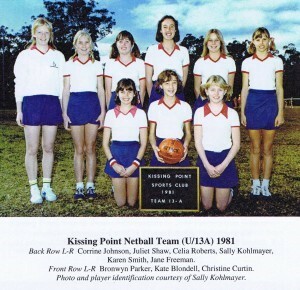 Kissing Point Netball Club is of the larger clubs playing in Ku-ring-gai Netball Association’s competitions on Sydney’s upper north shore. We are one of the 18 clubs participating in the main winter competition (March-August on Saturdays) and we’re also among the 11 clubs which compete in the mid-week spring competition (September-December). Both competitions are played across two venues at the Canoon Road courts in South Turramurra and at Lofberg Road, West Pymble. Our parent club, Kissing Point Sports’ Club, was created in 1957 when a group of about six interested people gathered with a view to establishing a soccer competition in the municipality. Back then, South Turramurra was still in its early days of development … there was no local shopping centre; the land where the high school now stands was still an orchard; Turramurra Public School had only opened four years earlier with 47 pupils; the land which the oval now occupies was still owned by flower growers and the Comenarra had not been built. It took three meetings of these enthusiasts to get the Kuringgai District Junior Soccer Association officially established and in that same year, South Turramurra’s first soccer team was formed. Competition between the six member clubs commenced immediately for boys aged 10-12. While the local press referred to the club as Kissing Point (after the road leading into the area), Ryde Council objected because it had already received a grant of land of the same name. The club might have officially been called South Turramurra but from 1958 it has always been known as Kissing Point. In the summer of 1961 / 62, five years after KPSC started playing soccer and had grown from one to six soccer teams, the Club decided to embark on its second sport – cricket. In 1966 – the same year the clubhouse opened – softball became the first girls’ sport introduced at KPSC when the local Turramurra Public School team sought out the chance to play their sport on the weekend. By 1968, KPSC was well established with soccer, cricket and rugby for boys and softball for girls but there was a need to provide more opportunities for girls. Netball (or women’s basketball as it was known back then) was a popular choice but there was no locally run competition in Ku-ring-gai and so the teams played outside the area, including with the Eastwood-Ryde Association. In that first year of competition, four premierships were won by Kissing Point. However, the locals tired of travelling long distances to play and so took action to establish the Ku-ring-gai Women’s Basketball Association in 1969, now known as Ku-ring-gai Netball Association or KNA. Matches were played on grass courts at various venues including Auluba Oval until 1979 when all competition moved to Canoon Road’s all-asphalt courts. 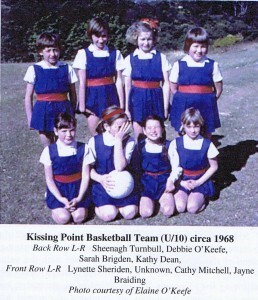 From 1969 to 1972, Kissing Point Netball was strongly represented with over 15 teams but come 1973, the Club suddenly had no teams! The reason for this is not clear but the records show the Club did not enter any teams due to no one being willing to accept the Netball Vice Presidency. The loss of players to other clubs was devastating and in 1974, KP registered only one senior team in D1 grade. The following year, the manager / coach of the U10 team was persuaded to take on the Vice Presidency and gradually player ranks were re-established to the point the club regained its current strong and healthy position fielding over 30 teams. In 2003, the Club was awarded the KNA Small Club of the Year award and since then, the number of teams steadily grew to the point that Kissing Point was named as KNA’s Large Club of the Year in 2009. The all-important netball uniforms developed over time. In 1968, the original navy blue tunic was home-made and worn with a white school shirt and a red cummerbund. This was replaced in 1978 with a royal blue wrap skirt and a white t-shirt with red collar and sleeve edges. This style lasted for 26 seasons until it was replaced in 2004 with a blue skirt with red and white inverted pleats and then again in 2012, when Kissing Point became the first KNA club to move to the current tunic design in our revered red, white and blue. It was 1978 before baseball would join the KPSC ranks. The sport was initially played under the auspices of Ku-ring-gai Baseball, who lent a kit between the two teams. In 1983, at the end of the winter softball season, an unofficial team of KP softballers was registered to play in the summer baseball competition. The all-girl team aged 15 to 26 was registered in the men’s all-age Ku-ring-gai League, in spite of the Club Executive not having endorsed the adoption of baseball as a sport; in spite of not having a Vice President and in spite of the softballers providing their own kit and uniforms. The next season saw baseball officially endorsed at KPSC. As the Kissing Point area rapidly developed, Ku-ring-gai Council acquired the Auluba market gardeners’ land and cottages for community and recreational purposes in 1959. In the early 1960s, KPSC was granted permission by the Council to use one of the acquired cottages as a clubhouse. Despite several working bees, the cottage fell victim to considerable vandalism and the project was abandoned and the building was destined for demolition. In mid-1964, Council budgeted to build a standard brick structure with a dressing room and toilet block at Auluba but following conferences with the Sports’ Club, an agreement was reached to incorporate a clubroom into the building for holding committee meetings. The estimated construction cost in 1965 was £2500 ($5000) for the dressing rooms and toilets and £1500 ($3000) for the clubroom. Construction commenced late in 1965 and completed mid-1966 when the first season of softball was played for the Club. Council required the Sports’ Club contribute £1200 ($600) towards the cost of the project, spread over five years to 1970. KPSC continued to grow and it was soon evident the original clubhouse would not be large enough for its intended purpose. It took until 1981 to confirm the addition of a clubhouse, kitchen and storeroom so the building could be used as a community facility. Construction was completed in mid-1983 with KPSC contributing over $20000 (one third) to the project. The five sporting codes are managed independently by volunteers from the members but across the board, the same philosophy is adhered to – A club for good sports – and teams are fielded across all age groups. Representatives from each code come together to form the committee for the parent body. We work hand-in-hand with Ku-Ring-Gai Municipal Council in managing the facilities. The clubhouse is a licensed venue and in the interests of providing a healthy environment for our members – old and young alike – Kissing Point Sports’ Club is one of more than 6500 clubs to participate in the Good Sports program. Good Sports is the largest health initiative in Australian sport. Operated by the Australian Drug Foundation, the aim is to try and build stronger, healthier and more family-friendly clubs for the local community by setting standards around key health issues of alcohol, smoking, obesity and mental health. The three-step accreditation process is simple but effective in improving the way alcohol is managed at sporting clubs. And there’s proof it works – research shows Good Sports reduces the likelihood of risky drinking by 37% and reduces the risk of alcohol-related harm to club members by 42%. Yay! We’re so lucky to have our own local clubhouse that provides a safe place for families to gather, overlooking the lit playing fields surrounded by natural bush land with plenty of room for the kids to run around.